This invention relates to an improved all-purpose liquid cleaner designed in particular for cleaning hard surfaces and which is effective in removing grease soil and/or bath soil and in leaving unrinsed surfaces with a shiny appearance as well as to an all purpose hard surface cleaner or light duty liquid detergent composition which contains a grease release agent and these compositions are effective in removing grease soil. In recent years all-purpose liquid detergents have become widely accepted for cleaning hard surfaces, e.g., painted woodwork and panels, tiled walls, wash bowls, bathtubs, linoleum or tile floors, washable wall paper, etc. Such all-purpose liquids comprise clear and opaque aqueous mixtures of water-soluble synthetic organic detergents and water-soluble detergent builder salts. In order to achieve comparable cleaning efficiency with granular or powdered all-purpose cleaning compositions, use of water-soluble inorganic phosphate builder salts was favored in the prior art all-purpose liquids. 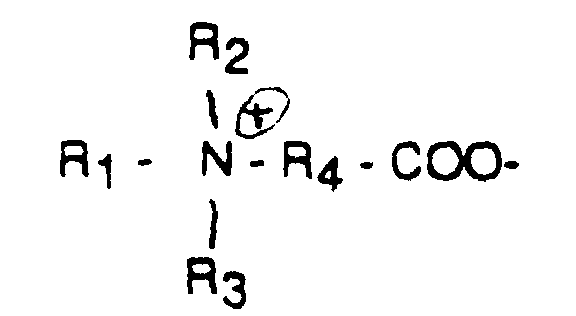 For example, such early phosphate-containing compositions are described in U.S. Patent Nos. 2,560,839; 3,234,138; 3,350,319; and British Patent No. 1,223,739. In order to overcome the foregoing disadvantage of the prior art all-purpose liquid, U.S. Patent No. 4,017,409 teaches that a mixture of paraffin sulfonate and a reduced concentration of inorganic phosphate builder salt should be employed. However, such compositions are not completely acceptable from an environmental point of view based upon the phosphate content. On the other hand, another alternative to achieving phosphate-free all-purpose liquids has been to use a major proportion of a mixture of anionic and nonionic detergents with minor amounts of glycol ether solvent and organic amine as shown in U.S. Patent No. 3,935,130. Again, this approach has not been completely satisfactory and the high levels of organic detergents necessary to achieve cleaning cause foaming which, in turn, leads to the need for thorough rinsing which has been found to be undesirable to today's consumers. Another approach to formulating hard surface or all-purpose liquid detergent composition where product homogeneity and clarity are important considerations involves the formation of oil-in-water (o/w) microemulsions which contain one or more surface-active detergent compounds, a water-immiscible solvent (typically a hydrocarbon solvent), water and a "cosurfactant" compound which provides product stability. By definition, an o/w microemulsion is a spontaneously forming colloidal dispersion of "oil" phase particles having a particle size in the range of 25 to 800 Å in a continuous aqueous phase. In view of the extremely fine particle size of the dispersed oil phase particles, microemulsions are transparent to light and are clear and usually highly stable against phase separation. Patent disclosures relating to use of grease-removal solvents in o/w microemulsions include, for example, European Patent Appplications EP 0137615 and EP 0137616 - Herbots et al; European Patent Application EP 0160762 - Johnston et al; and U.S. Patent No. 4,561,991 - Herbots et al. Each of these patent disclosures also teaches using at least 5% by weight of grease-removal solvent. It also is known from British Patent Application GB 2144763A to Herbots et al, published March 13, 1985, that magnesium salts enhance grease-removal performance of organic grease-removal solvents, such as the terpenes, in o/w microemulsion liquid detergent compositions. The compositions of this invention described by Herbots et al. require at least 5% of the mixture of grease-removal solvent and magnesium salt and preferably at least 5% of solvent (which may be a mixture of water-immiscible non-polar solvent with a sparingly soluble slightly polar solvent) and at least 0.1% magnesium salt. However, since the amount of water immiscible and sparingly soluble components which can be present in an o/w microemulsion, with low total active ingredients without impairing the stability of the microemulsion is rather limited (for example, up to about 18% by weight of the aqueous phase), the presence of such high quantities of grease-removal solvent tend to reduce the total amount of greasy or oily soils which can taken up by and into the microemulsion without causing phase separation. The following representative prior art patents also relate to liquid detergent cleaning compositions in the form of o/w microemulsions: U.S. Patents Nos. 4,472,291 -Rosario; 4.540,448 - Gauteer et al; 3,723,330 - Sheflin; etc. (c) from 0.5% to 10% of a polar solvent having a solubility in water at 15°C, in the range of from 0.2% to 10%. Other ingredients present in the formulations disclosed in this patent include from 0.05% to 2% by weight of an alkali metal, ammonium or alkanolammonium soap of a C13-C24 fatty acid; a calcium sequestrant from 0,5% to 13% by weight; non-aqueous solvent, e.g., alcohols and glycol ethers, up to 10% by weight; and hydrotropes, e.g., urea, ethanolamines, salts of lower alkylaryl sulfonates, up to 10% by weight. All of the formulations shown in the Examples of this patent include relatively large amounts of detergent builder salts which are detrimental to surface shine. Furthermore, the present invention teaches that in formulations containing grease-removal assisting magnesium compounds, the addition of minor amounts of builder salts, such as alkali metal polyphosphates, alkali metal carbonates, nitrilotriacetic acid salts, and so on, tends to make it more difficult to form stable microemulsion systems as well as causing residual deposits on the surface being cleaned, if they are incorporated into light duty liquid detergent compositions. EP-A-0 316 726 desbribes a stable microemulsion cleaning composition, which comprises synthetic organic detergent, water, cosurfactant and water-insoluble perfume, which is the only solvent. In EP-A-0 336 878, an acidic hard surface cleaner is described having a pH of 1-4. It comprises synthetic organic detergent, dicarboxylic acids, amino alkylene phosphonic acid and water. US-A-5,192,460 teaches also acidic aqueous cleaners based on the same ingredients as taught in EP-A-0 336 878. In EP-A-0 330 379 a single phase cleansing composition for the drilling industry is described containing 90-50 wt.% ether alcohol, 2-36 wt.% water and 25-0.9 wt.% hydrocarbon. It is indicated that certain ammonium and amino compounds can be present as fines suppressant. EP-A-0 554 991 relates to detergent compositions containing from 10 to 80 wt.% of a detergent mixture comprising primary alkyl sulfate, and betaine and/or amine oxide. In JP-A-3063202 teaches a plant growth regulator containing choline inorganic salts, a nonionic surfactant and an anionic surfactant. In US-A-5,008,030 a stable, acidic disinfectant liquid cleaning composition is described, substantially free of organic solvents, which composition contains nonionic surfactants, organic acid and an acid stable disinfectant in water. The present invention provides improved, clear, liquid cleaning compositions having improved interfacial tension which improves cleaning hard surface in the form of microemulsion or in non microemulsion compositions. These compositions are suitable for cleaning hard surfaces such as plastic, vitreous and metal surfaces having a shiny finish or in the form of an all purpose hard surface cleaner or a light duty liquid detergent. More particularly, the improved cleaning compositions exhibit good grease soil removal properties due to the improved interfacial tensions, when used in undiluted (neat) form and leave the cleaned surfaces shiny without the need of or requiring only minimal additional rinsing or wiping. The latter characteristic is evidenced by little or no visible residues on the unrinsed cleaned surfaces and, accordingly, overcomes one of the disadvantages of prior art products. The instant microemulsion or non microemulsion composition or light duty liquid detergent compositions exhibit a grease release effect in that the instant compositions impede or decrease the anchoring of greasy soil on surfaces that have been cleaned with the instant compositions as compared to surfaces cleaned with a commercial microemulsion composition which means that the grease soiled surface is easier to clean upon subsequent cleanings. Surprisingly, these desirable results are accomplished even in the absence of polyphosphate or other inorganic or organic detergent builder salts and also in the complete absence or substantially complete absence of grease-removal solvent. 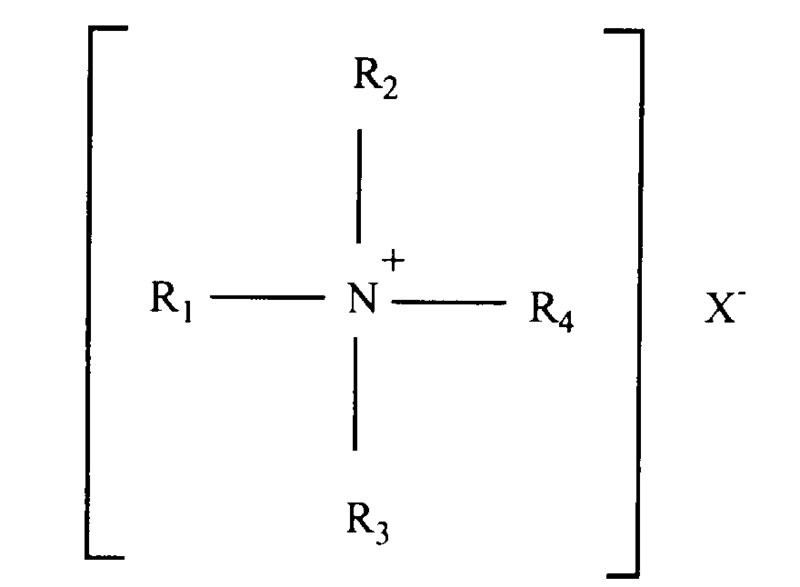 wherein R1 is a methyl group and R2, R3 and R4 are independently selected from the group consisting of CH3, C2H5, CH2CH2Y, wherein Y is selected from the group consisting of Cl, Br, CO2H, (CH2O)nOH, wherein n is 1 to 10, OH and CH2CH2OH and X is selected from. the group consisting of Cl-, Br-, methosulfate and HCO- 3.
wherein R1 is a methyl group and R2, R3 and R4 are independently selected from the group consisting of CH3, C2H5, CH2CH2Y, wherein Y is selected from the group consisting of Cl, Br, CO2H, (CH2O)nOH, wherein n is 1 to 10, OH and CH2CH2OH and X is selected from the group consisting of Cl-, Br-, methosulfate and HCO- 3; from 0.1% to 50% of a water-miscible cosurfactant having substantially no ability to dissolve oily or greasy soil selected from the group consisting of water-soluble C3-C4 alkanols, polypropylene glycol and C1-C4 alkyl ethers and esters of ethylene glycol or propylene glycol, aliphatic mono- and di-carboxylic acids containing 3 to 6 carbons in the molecule, C5-C15 alkyl ether polyetheneoxy carboxylic acids of the structural formula R(OC2H4)nOX COOH wherein R is C9-C15 alkyl, n is a number from 4 to 12 and X is selected from the group consisting of CH2, C(O)R1 and C(O), wherein R1 is a C1-C3 alkylene group and mono-, di- and triethyl phosphate and water; the oil phase of said microemulsion consisting essentially of a water-immiscible or hardly water-soluble hydrocarbon ingredient in an amount of from 0.1% to 10% by weight of the entire composition, said composition being particularly effective in removing oily or greasy soil from hard surfaces by solubilizing the oily or greasy soil in the oil phase of said microemulsion. (i) the balance being water. 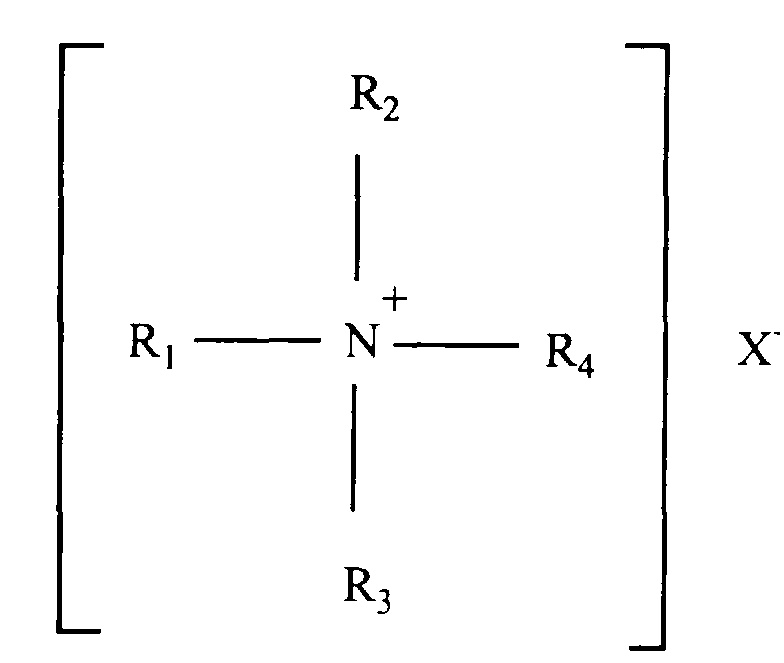 wherein R1 is a methyl group and R2, R3 and R4 are independently selected from the group consisting of CH3, C2H5, CH2CH2Y, and wherein Y is selected from the group consisting of Cl, Br, CO2H, (CH2O)nOH, wherein n is 1 to 10, OH, CH2CH2OH and X is selected from the group consisting of Cl-, Br-, methosulfate and HCO- 3; as a grease release agent. (d) the balance being water. (e) the balance being water. 10 to 85% of water, said proportions being based upon the total weight of the composition. Quite surprisingly although the perfume is not, per se, a solvent for greasy or oily soil, - even though some perfumes may, in fact, contain as much as about 80% of terpenes which are known as good grease solvents - the inventive compositions in dilute form have the capacity to solubilize up to about 10 times or more of the weight of the perfume of oily and greasy soil, which is removed or loosened from the hard surface by virtue of the action of the anionic surfactant, said soil being taken up into the oil phase of the o/w microemulsion. In a further aspect, the invention generally provides highly concentration microemulsion compositions in the form of either an oil-in-water (o/w) microemulsion or a water-in-oil (w/o) microemulsion which when diluted with additional water before use can form dilute o/w microemulsion compositions. Broadly, the concentrated microemulsion compositions contain, by weight, 0.1% to 20% of an anionic surfactant, 0.1% to 20% of a non-ionic surfactant, 0.1% to 50% of a cosurfactant, 0.1% to 5% of MgSO4·7H2O, 1% to 10% of a grease release agent, 0.4% to 10% of perfume or water insoluble hydrocarbon having about 6 to 18 carbon atoms, 0.1% to 50% of a cosurfactant, and 20% to 97% of water. The present invention relates to a stable microemulsion composition approximately by weight: 0.1% to 20% of an anionic surfactant. 0.1% to 50% of a cosurfactant, .1 % to 10% of a non-ionic surfactant, 0.1% to 5% MgSO4·7H2O, 0.1% to 10% of a grease release agent, 0.1 % to 10% of a water insoluble hydrocarbon or a perfume and the balance being water. The detergent compositions of the present invention can be in the form of an oil-in-water microemulsion in the first aspect or after dilution with water in the second aspect, with the essential ingredients being water, anionic/nonionic surfactant, cosurfactant, grease release agent, and a hydrocarbon or perfume. According to the present invention, the role of the hydrocarbon is provided by a non-water-soluble perfume. Typically, in aqueous based compositions the presence of a solubilizers, such as alkali metal lower alkyl aryl sulfonate hydrotrope, triethanolamine, urea, etc., is required for perfume dissolution, especially at perfume levels of about 1% and higher, since perfumes are generally a mixture of fragrant essential oils and aromatic compounds which are generally not water-soluble. Therefore, by incorporating the perfume into the aqueous cleaning composition as the oil (hydrocarbon) phase of the ultimate o/w microemulsion composition, several different important advantages are achieved. As used herein and in the appended claims the term "perfume" is used in its ordinary sense to refer to and include any non-water soluble fragrant substance or mixture of substances including natural (i.e., obtained by extraction of flower, herb, blossom or plant), artificial (i.e., mixture of natural oils or oil constituents) and synthetically produced substance) odoriferous substances. Typically, perfumes are complex mixtures of blends of various organic compounds such as alcohols, aldehydes, ethers, aromatic compounds and varying amounts of essential oils (e.g., terpenes) such as from 0% to 80%, usually from 10% to 70% by weight, the essential oils themselves being volatile odoriferous compounds and also serving to dissolve the other components of the perfume. In the present invention the precise composition of the perfume is of no particular consequence to cleaning performance so long as it meets the criteria of water immiscibility and having a pleasing odor. Naturally, of course, especially for cleaning compositions intended for use in the home, the perfume, as well as all other ingredients, should be cosmetically acceptable, i.e., non-toxic, hypoallergenic, etc. The hydrocarbon such as a perfume is present in the dilute o/w microemulsion in an amount of from 0.4% to 10% by weight, preferably from 0.1 % to 3.0% by weight, especially preferably from 0.5% to 2.0% by weight, such as about weight percent. If the amount of hydrocarbon (perfume) is less than about 0.4% by weight it becomes difficult to form the o/w microemulsion. If the hydrocarbon (perfume) is added in amounts more than about 10% by weight, the cost is increased without any additional cleaning benefit and, in fact, with some diminishing of cleaning performance insofar as the total amount of greasy or oily soil which can be taken up in the oil phase of the microemulsion will decrease proportionately. Furthermore, although superior grease removal performance will be achieved for perfume compositions not containing any terpene solvents, it is apparently difficult for perfumers to formulate sufficiently inexpensive perfume compositions for products of this type (i.e., very cost sensitive consumer-type products) which includes less than about 20%, usually less than about 30%, of such terpene solvents. Thus, merely as a practical matter, based on economic consideration, the dilute o/w microemulsion detergent cleaning compositions of the present invention may often include as much as 0.2% to 7% by weight, based on the total composition, of terpene solvents introduced thereunto via the perfume component. However, even when the amount of terpene solvent in the cleaning formulation is less than 1.5% by weight, such as up to about 0.6% by weight or 0.4% by weight or less, satisfactory grease removal and oil removal capacity is provided by the inventive diluted o/w microemulsions. Thus, for a typical formulation of a diluted o/w microemulsion according to this invention a 20 milliliter sample of o/w microemulsion containing about 1% by weight of perfume will be able to solubilize, for example, up to about 2 to 3 ml of greasy and/or oily soil, while retaining its form as a microemulsion, regardless of whether the perfume contains 0%, 0.1%, 0.2%, 0.3%, 0.4%. 0.5%, 0.6%, 0.7% or 0.8% by weight of terpene solvent. In other words, it is an essential feature of the compositions of this invention that grease removal is a function of the result of the microemulsion, per se, and not of the presence or absence in the microemulsion of a "greasy soil removal" type of solvent. In place of the perfume one can employ a water insoluble paraffin or isoparaffin having about 6 to about 18 carbon at a concentration of 0.4 to 8.0 wt. percent, more preferably 0.4 to 3.0 wt. %. Regarding the anionic detergent present in the o/w microemulsions any of the conventionally used water-soluble anionic detergents can be used in this invention. As used herein the term "anionic surfactant" is intended to refer to the class of anionic and mixed anionic-nonionic detergents providing detersive action. Suitable water-soluble non-soap, anionic detergents used in the instant compositions include those surface-active or detergent compounds which contain an organic hydrophobic group containing generally 8 to 26 carbon atoms and preferably 10 to 18 carbon atoms in their molecular structure and at least one water-solubilizing group selected from the group of sulfonate, sulfate and carboxylate so as to form a water-soluble detergent. Usually, the hydrophobic group will include or comprise a C8-C22 alkyl, alkyl or acyl group. Such detergents are employed in the form of water-soluble salts and the salt-forming cation usually is selected from the group consisting of sodium, potassium, ammonium, magnesium and mono-, di- or tri-C2-C3 alkanolammonium, with the sodium, magnesium and ammonium cations again being preferred. A preferred sulfonate is linear alkyl benzene sulfonate having a high content of 3-(or higher) phenyl isomers and a correspondingly low content (well below 50%) of 2- (or lower) phenyl isomers, that is, wherein the benzene ring is preferably attached in large part at the 3 or higher (for example, 4, 5, 6 or 7) position of the alkyl group and the content of the isomers in which the benzene ring is attached in the 2 or 1 position is correspondingly low. Particularly preferred materials are set forth in U.S. Patent 3,320,174. Other suitable anionic detergents are the olefin sulfonates, including long-chain alkene sulfonates, long-chain hydroxyalkane sulfonates or mixtures of alkene sulfonates and hydroxyalkane sulfonates. 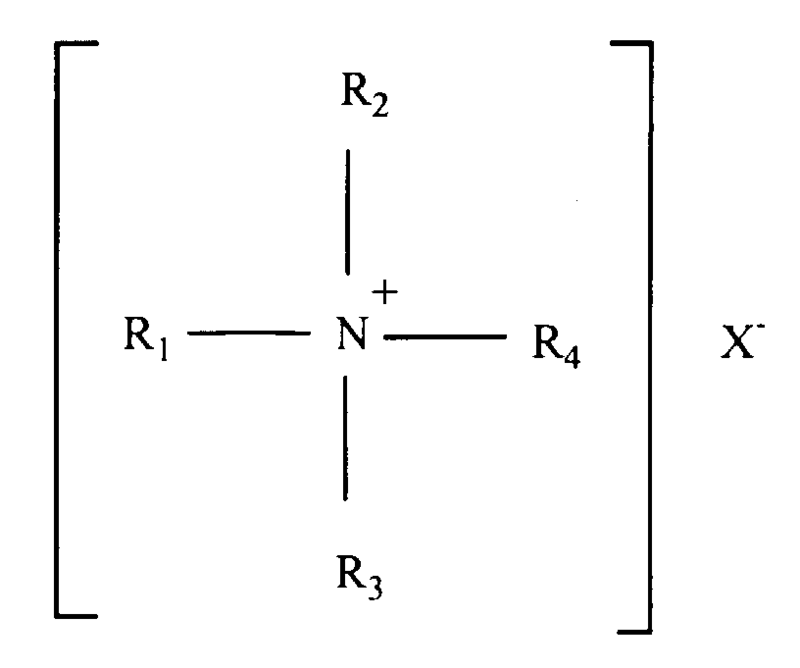 These olefin sulfonate detergents may be prepared in a known manner by the reaction of sulfur trioxide (SO3) with long-chain olefins containing 8 to 25, preferably 12 to 21 carbon atoms and having the formula RCH=CHR1 where R is a higher alkyl group of 6 to 23 carbons and R1 is an alkyl group of 1 to 17 carbons or hydrogen to form a mixture of sultones and alkene sulfonic acids which is then treated to convert the sultones to sulfonates. Preferred olefin sulfonates contain from 14 to 16 carbon atoms in the R alkyl group and are obtained by sulfonating an 2 olefin. Other examples of suitable anionic sulfonate detergents are the paraffin sulfonates containing 10 to 20, preferably 13 to 17, carbon atoms. Primary paraffin sulfonates are made by reacting long-chain alpha olefins and bisulfites and paraffin sulfonates having the sulfonate group distributed along the paraffin chain are shown in U.S. Patents Nos., 2,503,280: 2,507,088: 3,260,744: 3,372,188: and German Patent 735,096. 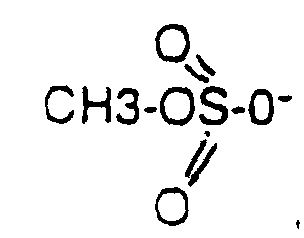 Examples of satisfactory anionic sulfate detergents are the C8-C18 alkyl sulfate salts and the C8-C18 alkyl ether polyethenoxy sulfate salts having the formula R(OC2H4)n OSO3M wherein n is 1 to 12, preferably 1 to 5, and M is a solubilizing cation selected from the group consisting of sodium, potassium, ammonium, magnesium and mono-, di- and triethanol ammonium ions. The alkyl sulfates may be obtained by sulfating the alcohols obtained by reducing glycerides of coconut oil or tallow or mixtures thereof and neutralizing the resultant product. 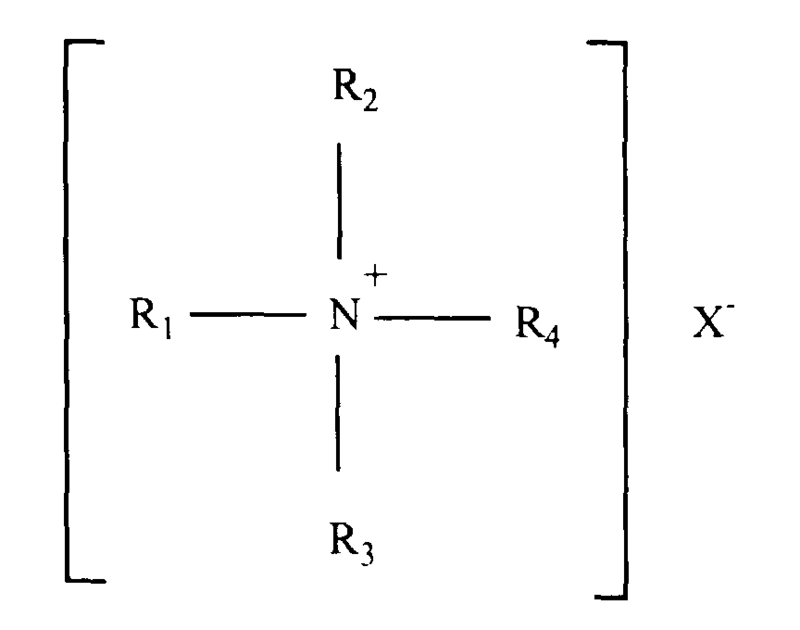 On the other hand, the alkyl ether polyethenoxy sulfates are obtained by sulfating the condensation product of ethylene oxide with a C8-C18 alkanol and neutralizing the resultant product. The alkyl sulfates may be obtained by sulfating the alcohols obtained by reducing glycerides of coconut oil or tallow or mixtures thereof and neutralizing the resultant product. 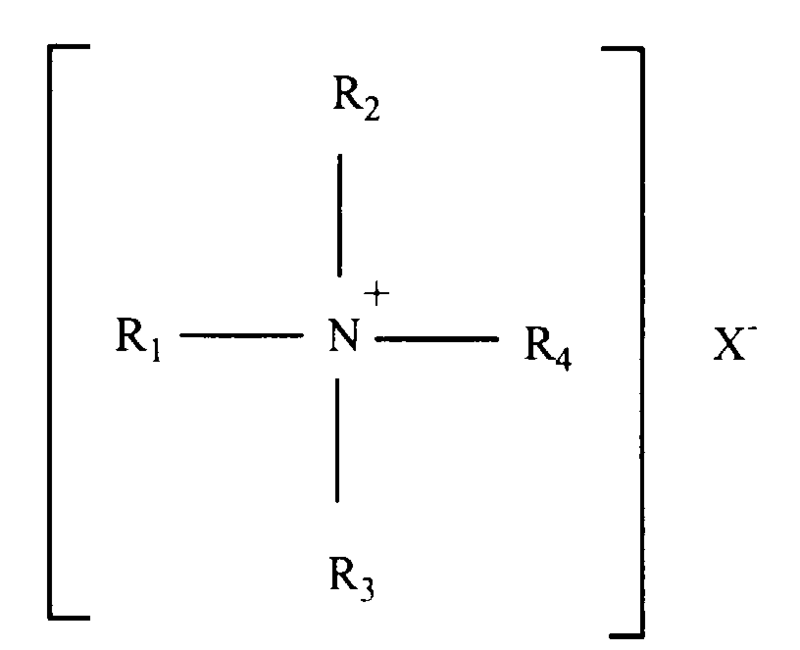 On the other hand, the alkyl ether polyethenoxy sulfates are obtained by sulfating the condensation product of ethylene oxide with a C8-C18 alkanol and neutralizing the resultant product. The alkyl ether polyethenoxy sulfates differ from one another in the number of moles of ethylene oxide reacted with one mole of alkanol. Preferred alkyl sulfates and preferred alkyl ether polyethenoxy sulfates contain 10 to 16 carbon atoms in the alkyl group. COOH and C10-C12 alkyl ether polyethenoxy (5-7) CH2COOH. 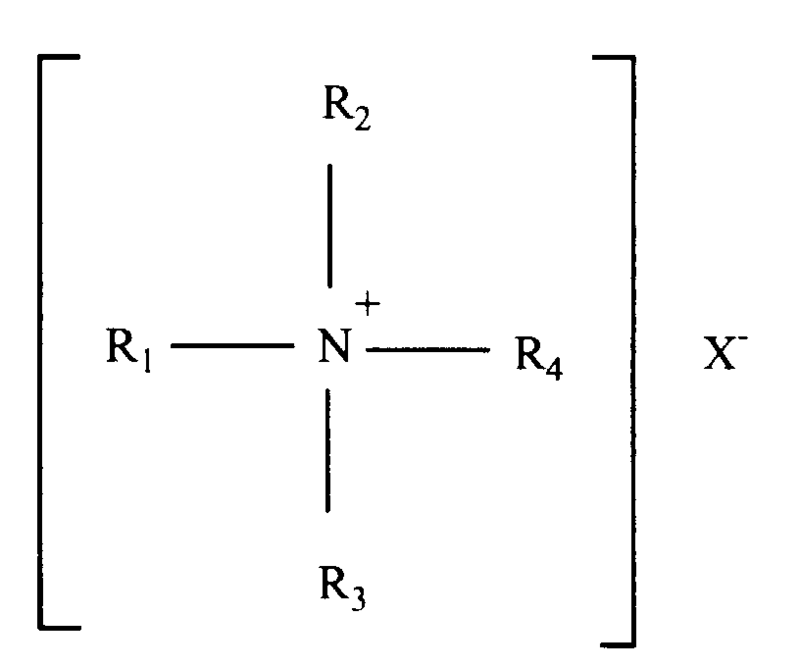 These compounds may be prepared by considering ethylene oxide with appropriate alkanol and reacting this reaction product with chloracetic acid to make the ether carboxylic acids as shown in US Pat. No. 3,741,911 or with succinic anhydride or phtalic anhydride. Obviously, these anionic detergents will be present either in acid form or salt form depending upon the pH of the final composition, with salt forming cation being the same as for the other anionic detergents. Of the foregoing non-soap anionic detergents, the preferred detergents are the C9-C15 linear alkylbenzene sulfonates and the C13-C17 paraffin or alkane sulfonates. Particularly, preferred compounds are sodium C10-C13 alkylbenzene sulfonate and sodium C13-C17 alkane sulfonate. Generally, the proportion of the nonsoap-anionic detergent will be in the range of 0.1% to 20.0%, preferably from 1% to 7%, by weight of the dilute o/w microemulsion composition. HCO- 3. Preferred grease release agents are β-hydroxyethyltrimethyl ammonium chloride (choline chloride), β-chloroethyltrimethyl ammonium chloride, and tri(β-hydroxyethyl) methyl ammonium methosulfate (Stepanquat T®), wherein the choline chloride is preferred. It is theorized that the positively charged grease release agent is electrostatically bonded to the negatively charged groups on the surface of the surface to be cleaned such as a ceramic thereby preventing bonding of calcium ions contained in grease to the negative charged surface of the ceramic tile. The concentration of the grease release agent in the instant microemulsion composition is 0.1 to 10 wt. % and more preferably 1.0 to 8.0 wt. %. The cosurfactant may play an essential role in the formation of the dilute o/w microemulsion and the concentrated microemulsion compositions. Very briefly, in the absence of the cosurfactant the water, detergent(s) and hydrocarbon (e.g., perfume) will, when mixed in appropriate proportions form either a micellar solution (low concentration) or form an oil-in-water emulsion in the first aspect of the invention. With the cosurfactant added to this system, the interfacial tension at the interface between the emulsion droplets and aqueous phase is reduced to a very low value (never negative). This reduction of the interfacial tension results in spontaneous break-up of the emulsion droplets to consecutively smaller aggregates until the state of a transparent colloidal sized emulsion. e.g., a microemulsion, is formed. In the state of a microemulsion, thermodynamic factors come into balance with varying degrees of stability related to the total free energy of the microemulsion. Some of the thermodynamic factors involved in determining the total free energy of the system are (1) particle-particle potential; (2) interfacial tension or free energy (stretching and bending); (3) droplet dispersion entropy; and (4) chemical potential changes upon formation. A thermodynamically stable system is achieved when (2) interfacial tension or free energy is minimized and (3) droplet dispersion entropy is maximized. Thus, the role of cosurfactant in formation of a stable o/w microemulsion is to (a) decrease interfacial tension (2); and (b) modify the microemulsion structure and increase the number of possible configurations (3). Also, the cosurfactant will (c) decrease the rigidity of the interfacial film..
Four major classes of compounds have been found to provide highly suitable cosurfactants over temperature ranges extending from 5°C to 43°C for instance; (1) water-soluble C3-C4 alkanols, polypropylene glycol of the formula HO(CH3CHCH2O)nH wherein n is a number from 2 to 18 and monoalkyl ethers and esters of ethylene glycol and propylene glycol having the structural formulas R(X)nOH and R1(X)nOH wherein R is C1-C6 alkyl, R1 is C2-C4 acyl group, X is (OCH2CH2) or (OCH3CHCH2) and n is a number from 1 to 4; (2) aliphatic mono- and di-carboxylic acids containing 2 to 10 carbon atoms, preferably 3 to 6 carbons in the molecule; (3) the aforementioned alkyl ether polyethenoxy carboxylic acids discussed above, when the anionic carboxylate form of this compound is not present; and (4) triethyl phosphate. Additionally, mixtures of two or more of the four classes of cosurfactant compounds may be employed where specific pH's are desired. When the mono- and di-carboxylic acid (Class 2) cosurfactants are employed in the instant microemulsion compositions at a concentration of 2 to 10 wt. %, the microemulsion compositions can be used as a cleaners for bathtubs and other hard surfaced items, which are acid resistant or are made of zirconium white enamel thereby removing lime scale, soap scum and greasy soil from the surfaces of such items damaging such surfaces. An aminoalkylene phophonic acid at a concentration of 0.01 to 0.2 wt. % can be optionally used in conjunction with the mono- and di-carboxylic acids, wherein the aminoalkylene phosphonic acid helps prevent damage to zirconium white enamel surfaces. Additionally, 0.05 to 1% of phosphoric acid can be used in the composition. Representative members of the polypropylene glycol include dipropylene glycol and polypropylene glycol having a molecular weight of 200 to 1000, e.g., polypropylene glycol 400. Other satisfactory glycol ethers are ethylene glycol monobutyl ether (butyl cellosolve), diethylene glycol monobutyl ether (butyl carbitol), triethylene glycol monobutyl ether, mono, di, tri propylene glycol monobutyl ether, tetraethylene glycol monobutyl ether, propylene glycol tertiary butyl ether, ethylene glycol monoacetate and dipropylene glycol propionate. While all of the aforementioned glycol ether compounds and acid compounds provide the described stability, the most preferred cosurfactant compounds of each type, on the basis of cost and cosmetic appearance (particularly odor), are diethylene glycol monobutyl ether and a mixture of adipic, glutaric and succinic acids, respectively. The ratio of acids in the foregoing mixture is not particularly critical and can be modified to provide the desired odor. Generally, to maximize water solubility of the acid mixture glutaric acid, the most water-soluble of these three saturated aliphatic dibasic acids, will be used as the major component. Generally, weight ratios of adipic acid: glutaric acid:succinic acid is 1-3:1-8:1-5, preferably 1-2:1-6:1-3, such as 1:1:1, 1:2:1, 2:2:1, 1:2:1.5, 1:2:2, 2:3:2, etc. can be used with equally good results. The amount of cosurfactant required to stabilize the microemulsion compositions will, of course, depend on such factors as the surface tension characteristics of the cosurfactant, the type and amounts of the primary surfactants and perfumes, and the type and amounts of any other additional ingredients which may be present in the composition and which have an influence on the thermodynamic factors enumerated above. Generally, amounts of cosurfactant in the range of from 0% to 50%, preferably from 0.5% to 15%, especially preferably from 1% to 7%, by weight provide stable dilute o/w microemulsions for the above-described levels of primary surfactants and perfume and any other additional ingredients as described below. As will be appreciated by the practitioner, the pH of the final microemulsion will be dependent upon the identity of the cosurfactant compound, with the choice of the cosurfactant being effected by cost and cosmetic properties, particularly odor. For example, microemulsion compositions which have a pH in the range of 1 to 10 may employ either the class 1 or the class 4 cosurfactant as the sole cosurfactant, but the pH range is reduced to 1 to 8.5 when the polyvalent metal salt is present. On the other hand, the class 2 cosurfactant can only be used as the sole cosurfactant where the product pH is below 3.2. Similarly, the class 3 cosurfactant can be used as the sole cosurfactant where the product pH is below 5. However, where the acidic cosurfactants are employed in admixture with a glycol ether cosurfactant, compositions can be formulated at a substantially neutral pH (e.g., pH 7±1.5, preferably 7±0.2). The final essential ingredient in the inventive microemulsion compositions having improved interfacial tension properties is water. The proportion of water in the microemulsion compositions generally is in the range of 20% to 97%, preferably 70% to 97% by weight of the usual diluted o/w microemulsion composition. As believed to have been made clear from the foregoing description, the dilute o/w microemulsion liquid all-purpose cleaning compositions of this invention are especially effective when used as is, that is, without further dilution in water, since the properties of the composition as an o/w microemulsion are best manifested in the neat (undiluted) form. However, at the same time it should be understood that depending on the levels of surfactants, cosurfactants, perfume and other ingredients, some degree of dilution without disrupting the microemulsion, per se, is possible. For example, at the preferred low levels of active surfactant compounds (i.e., primary anionic and nonionic detergents) dilutions up to about 50% will generally be well tolerated without causing phase separation, that is, the microemulsion state will be maintained. However, even when diluted to a great extent, such as a 2- to 10-fold or more dilution, for example, the resulting compositions are still effective in cleaning greasy, oily and other types of soil. Furthermore, the presence of magnesium ions or other polyvalent ions, e.g., aluminum, as will be described in greater detail below further serves to boost cleaning performance of the primary detergents in dilute usage. Such concentrated microemulsions can be diluted by mixing with up to about 20 times or more, preferably 4 to 10 times their weight of water to form o/w microemulsions similar to the diluted microemulsion compositions described above. While the degree of dilution is suitably chosen to yield an o/w microemulsion composition after dilution, it should be recognized that during the course of dilution both microemulsion and non-microemulsions may be successively encountered. One such ingredient is an inorganic or organic salt of oxide of a multivalent metal cation, particularly Mg++. The metal salt or oxide provides several benefits including improved cleaning performance in dilute usage, particularly in soft water areas, and minimized amounts of perfume required to obtain the microemulsion state. Magnesium sulfate, either anhydrous or hydrated (e.g., heptahydrate), is especially preferred as the magnesium salt. Good results also have been obtained with magnesium oxide, magnesium chloride, magnesium acetate, magnesium propionate and magnesium hydroxide. These magnesium salts can be used with formulations at neutral or acidic pH since magnesium hydroxide will not precipitate at these pH levels. Although magnesium is the preferred multivalent metal from which the salts (inclusive of the oxide and hydroxide) are formed, other polyvalent metal ions also can be used provided that their salts are nontoxic and are soluble in the aqueous phase of the system at the desired pH level. Thus, depending on such factors as the pH of the system, the nature of the primary surfactants and cosurfactant, and so on, as well as the availability and cost factors, other suitable polyvalent metal ions include aluminum, copper, nickel, iron, calcium, etc. It should be noted, for example, that with the preferred paraffin sulfonate anionic detergent calcium salts will precipitate and should not be used. It has also been found that the aluminum salts work best at pH below 5 or when a low level, for example about 1 weight percent, of citric acid is added to the composition which is designed to have a neutral pH. Alternatively, the aluminum salt can be directly added as the citrate in such case. As the salt, the same general classes of anions as mentioned for the magnesium salts can be used, such as halide (e.g., bromide, chloride), sulfate, nitrate, hydroxide, oxide, acetate, propionate, etc. Preferably, in the dilute compositions the metal compound is added to the composition in an amount sufficient to provide at least a stoichiometric equivalent between the anionic surfactant and the multivalent metal cation. For example, for each gram-ion of Mg++ there will be 2 gram moles of paraffin sulfonate, alkylbenzene sulfonate, etc., while for each gram-ion of Al3+ there will be 3 gram moles of anionic surfactant. Thus, the proportion of the multivalent salt generally will be selected so that one equivalent of compound will neutralize from 0.1 to 1.5 equivalents, preferably 0.9 to 1.4 equivalents, of the acid form of the anionic detergent. At higher concentrations of anionic detergent, the amount of multivalent salt will be in range of 0.5 to 1 equivalents per equivalent of anionic detergent. The o/w microemulsion compositions can optionally include from 0% to 5%, preferably from 0.1% to 2.0% by weight of the composition of a C8-C22 fatty acid or fatty acid soap as a foam suppressant. The addition of fatty acid or fatty acid soap provides an improvement in the rinseability of the composition whether applied in neat or diluted form. Generally, however, it is necessary to increase the level of cosurfactant to maintain product stability when the fatty acid or soap is present. As example of the fatty acids which can be used as such or in the form of soap, mention can be made of distilled coconut oil fatty acids, "mixed vegetable" type fatty acids (e.g. high percent of saturated, mono-and/or polyunsaturated C18 chains); oleic acid, stearic acid, palmitic acid, eiocosanoic acid, and the like, generally those fatty acids having from 8 to 22 carbon atoms being acceptable. The microemulsion composition of this invention may, if desired, also contain other components either to provide additional effect or to make the product more attractive to the consumer. The following are mentioned by way of example: Colors or dyes in amounts up to 0.5% by weight: bactericides in amounts up to 1% by weight: preservatives or antioxidizing agents, such as formalin, 5-bromo-5-nitro-dioxan-1,3; 5-chloro-2-methyl-4-isothaliazolin-3-one, 2,6-di-tert-butyl-p-cresol, etc.. in amounts up to 2% by weight; and pH adjusting agents, such as sulfuric acid or sodium hydroxide, as needed. Furthermore, if opaque compositions are desired. up to 4% by weight of an opacifier may be added. In final form, the oil-in-water microemulsions exhibit stability at reduced and increased temperatures. More specifically, such compositions remain clear and stable in the range of 5°C to 50°C, especially 10°C to 43°C. Such compositions exhibit a pH in the acid or neutral range depending on intended end use. The liquids are readily pourable and exhibit a viscosity in the range of 6 to 60 milliPascal . second (mPas.) as measured at 25°C, with a Brookfield® RVT Viscometer using a #1 spindle rotating at 20 RPM. Preferably, the viscosity is maintained in the range of 10 to 40 mPas. Because the compositions as prepared are aqueous liquid formulations and since no particular mixing is required to form the o/w microemulsion, the compositions are easily prepared simply by combining all the ingredients in a suitable vessel or container. The order of mixing the ingredients is not particularly important and generally the various ingredients can be added sequentially or all at once or in the form of aqueous solutions of each or all of the primary detergents and cosurfactants can be separately prepared and combined with each other and with the perfume. The magnesium salt, or other multivalent metal compound, when present, can be added as an aqueous solution thereof or can be added directly. It is not necessary to use elevated temperatures in the formation step and room temperature is sufficient. The nonionic surfactant can be present in the light duty liquid detergent composition in amounts of 0 to 50%, preferably 1 to 30%, most preferably 2 to 25%, by weight of the light duty liquid detergent composition and provides superior performance in the removal of oily soil and mildness to human skin. The water soluble nonionic surfactants utilized in this invention are commercially well known and include the primary aliphatic alcohol ethoxylates, secondary aliphatic alcohol ethoxylates, alkylphenol ethoxylates and ethylene-oxide-propylene oxide condensates on primary alkanols, such a Plurafacs® (BASF) and condensates of ethylene oxide with sorbitan fatty acid esters such as the Tweens® (ICI). The nonionic synthetic organic detergents generally are the condensation products of an organic aliphatic or alkyl aromatic hydrophobic compound and hydrophilic ethylene oxide groups. Practically any hydrophobic compound having a carboxy, hydroxy, amido, or amino group with a free hydrogen attached to the nitrogen can be condensed with ethylene oxide or with the polyhydration product thereof, polyethylene glycol, to form a water soluble nonionic detergent. Further, the length of the polyethenoxy hydrophobic and hydrophilic elements. The nonionic detergent class includes the condensation products of a higher alcohol (e.g., an alkanol containing 8 to 18 carbon atoms in a straight or branched chain configuration) condensed with 5 to 30 moles of ethylene oxide, for example, lauryl or myristyl alcohol condensed with about 16 moles of ethylene oxide (EO), tridecanol condensed with about 6 to moles of EO, myristyl alcohol condensed with about 10 moles of EO per mole of myristyl alcohol, the condensation product of EO with a cut of coconut fatty alcohol containing a mixture of fatty alcohols with alkyl chains varying from 10 to 14 carbon atoms in length and wherein the condensate contains either about 6 moles of EO per mole of total alcohol or about 9 moles of EO per mole of alcohol and tallow alcohol ethoxylates containing 6 EO to 11 EO per mole of alcohol. A preferred group of the foregoing nonionic surfactants are the Neodol® ethoxylates (Shell Co.), which are higher aliphatic, primary alcohol containing about 9-15 carbon atoms, such as C9-C11 alkanol condensed with 8 moles of ethylene oxide (Neodol® 91-8), C12-13 alkanol condensed with 6.5 moles ethylene oxide (Neodol® 23-6.5), C12-15 alkanol condensed with 12 moles ethylene oxide (Neodol® 25-12), C14-15 alkanol condensed with 13 moles ethylene oxide (Neodol® 45-13), and the like. Such ethoxamers have an HLB (hydrophobic lipophilic balance) value of about 8 to 15 and give good O/W emulsification, whereas ethoxamers with HLB values below 8 contain less than 5 ethyleneoxide groups and tend to be poor emulsifiers and poor detergents. Additional satisfactory water soluble alcohol ethylene oxide condensates are the condensation products of a secondary aliphatic alcohol containing 8 to 18 carbon atoms in a straight or branched chain configuration condensed with 5 to 30 moles of ethylene oxide. Examples of commercially available nonionic detergents of the foregoing type are C11-C15 secondary alkanol condensed with either 9 EO (Tergitol® 15-S-9) or 12 EO (Tergitol® 15-S-12) marketed by Union Carbide. Other suitable nonionic detergents include the polyethylene oxide condensates of one mole of alkyl phenol containing from 8 to 18 carbon atoms in a straight- or branched chain alkyl group with 5 to 30 moles of ethylene oxide. Specific examples of alkyl phenol ethoxylates include nonyl condensed with about 9.5 moles of EO per mole of nonyl phenol, dinonyl phenol condensed with about 12 moles of EO per mole of phenol, dinonyl phenol condensed with about 15 moles of EO per mole of phenol and di-isoctylphenol condensed with about 15 moles of EO per mole of phenol. Commercially available nonionic surfactants of this type include Igepal® CO-630 (nonyl phenol ethoxylate) marketed by GAF Corporation. Also among the satisfactory nonionic detergents are the water-soluble condensation products of a C8-C20 alkanol with a heteric mixture of ethylene oxide and propylene oxide wherein the weight ratio or ethylene oxide to propylene oxide is from 2.5:1 to 4:1, preferably 2.8:1 to 3.3:1, with the total of the ethylene oxide and propylene oxide (including the terminal ethanol or proponol group) being from 60-85%, preferably 70 to 80%, by weight. Such detergents are commercially available from BASF-Wyandotte and a particularly preferred detergent is a C10-C16 alkanol condensate with ethylene oxide and propylene oxide, the weight ratio of ethylene oxide to propylene oxide being 3:1 and the total alkoxy content being about 75% by weight. Condensates of 2 to 30 moles of ethylene oxide with sorbitan mono- and tri-C10-C20 alkanoic acid esters having a HLB of 8 to 15 also may be employed as the nonionic detergent ingredient in the described shampoo. These surfactants are well known and are available from Imperial Chemical Industries under the Tween trade name. Suitable surfactants include polyoxyethylene (4) sorbitan monolaurate, polyoxyethylene (4) sorbitan monostearate, polyoxyethylene (20) sorbitan trioleate and polyoxyethylene (20) sorbitan tristearate. Other suitable water-soluble nonionic detergents which are less preferred are marketed under the trade name "Pluronics®". The compounds are formed by condensing ethylene oxide with a hydrophobic base formed by the condensation of propylene oxide with propylene glycol. The molecular weight of the hydrophobic portion of the molecule is of the order of 950 to 4000 and preferably 200 to 2.500. The addition of polyoxyethylene radicals to the hydrophobic portion tends to increase the solubility of the molecule as a whole so as to make the surfactant water-soluble. The molecular weight of the block polymers varies from 1,000 to 15,000 and the polyethylene oxide content may comprise 20% to 80% by weight. Preferably, these surfactants will be in liquid form and satisfactory surfactants are available as grades L62® and L64®. The anionic surfactant, used in the light duty liquid detergent composition are the same anionic surfactants as used in the aforementioned microemulsion compositions and, constitutes 0% to 50%, preferably 1% to 30%, most preferably 2 to 25%, by weight thereof and provides good foaming properties. However, preferably reduced amounts are utilized in order to enhance the mildness of the skin property desired in the inventive compositions. 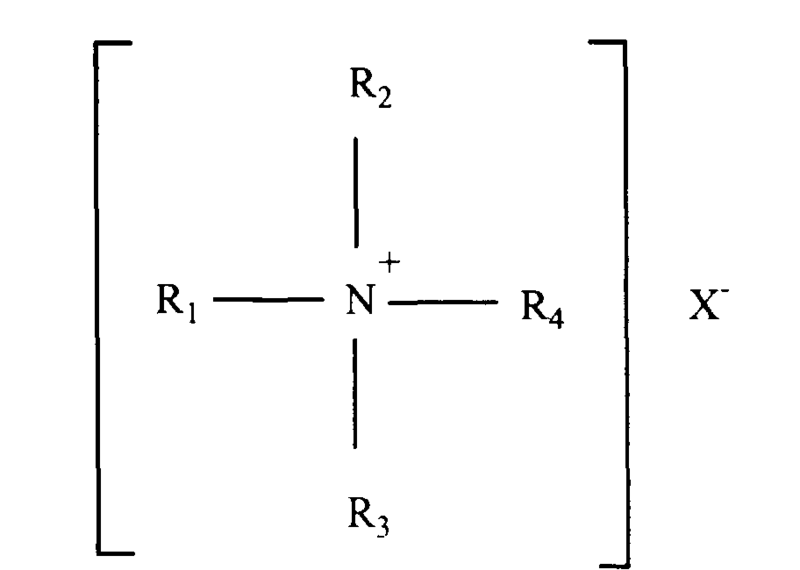 wherein R is an alkyl group having 9 to 19 carbon atoms and a is the integer 1 to 4: R2 and R3 are each alkyl groups having 1 to 3 carbons and preferably 1 carbon; R4 is an alkylene or hydroxyalkylene group having from 1 to 4 carbon atoms and, optionally, one hydroxyl group. Typical alkyldimethyl betaines include decyl dimethyl betaine or 2-(N-decyl-N, N-dimethyl-ammonia) acetate, coco dimethyl betaine or 2-(N-coco N, N-dimethylammonio) acetate, myristyl dimethyl betaine, palmityl dimethyl betaine, lauryl dimethyl betaine, cetyl dimethyl betaine, stearyl dimethyl betaine, etc. The amidobetaines similarly include cocoamidoethylbetaine, cocoamidopropyl betaine and the like. A preferred betaine is coco (C8-C18) amidopropyl dimethyl betaine. The instant light duty liquid detergent composition contains at least 5 wt. % of at least one of the surfactants selected from the group consisting of the nonionic surfactant, the anionic surfactant and the betaine surfactant or a mixture thereof. wherein X is hydrogen or an alkali metal cation, preferably sodium. In addition to the previously mentioned essential and optional constituents of the light duty liquid detergent, one may also employ normal and conventional adjuvants, provided they do not adversely affect the properties of the detergent. Thus, there may be used various coloring agents and perfumes: ultraviolet light absorbers such as the Uvinuls®, which are products of GAF Corporation; sequestering agents such as ethylene diamine tetraacetates; magnesium sulfate heptahydrate; pearlescing agents and opacifiers; pH modifiers; etc. The proportion of such adjuvant materials, in total will normally not exceed 15% of weight of the detergent composition, and the percentages of most of such individual components will be 0.1% to 5% by weight and preferably less than about 2% by weight. Sodium formate can be included in the formula as a perservative at a concentration of 0.1 to 4.0%. Sodium bisulfite can be used as a color stabilizer at a concentration of 0.01 to 0.2 wt.%. Typical perservatives are dibromodicyano-butane, citric acid, benzylic alcohol and poly (hexamethylene-biguamide) hydro-chloride and mixtures thereof. The instant light duty liquid detergent compositions can contain 0.1 to 4 wt. %, more preferably 0.5 to 3.0 wt. % of an alkyl polysaccharide surfactant. The alkyl polysaccharides surfactants, which are used in conjunction with the aforementioned surfactants have a hydrophobic group containing from 8 to 20 carbon atoms, preferably from 10 to 16 carbon atoms, most preferably from 12 to 14 carbon atoms, and polysaccharide hydrophilic group containing from 1.5 to 10, preferably from 1.5 to 4, most preferably from 1.6 to 2.7 saccharide units (e.g., galactoside, glucoside, fructoside, glucosyl, fructosyl; and/or galactosyl units). Mixtures of saccharide moieties may be used in the alkyl polysaccharide surfactants. The number x indicates the number of saccharide units in a particular alkyl polysaccharide surfactant. For a particular alkyl polysaccharide molecule x can only assume integral values. In any physical sample of alkyl polysaccharide surfactants there will be in general molecules having different x values. The physical sample can be characterized by the average value of x and this average value can assume non-integral values. In this specification the values of x are to be understood to be average values. 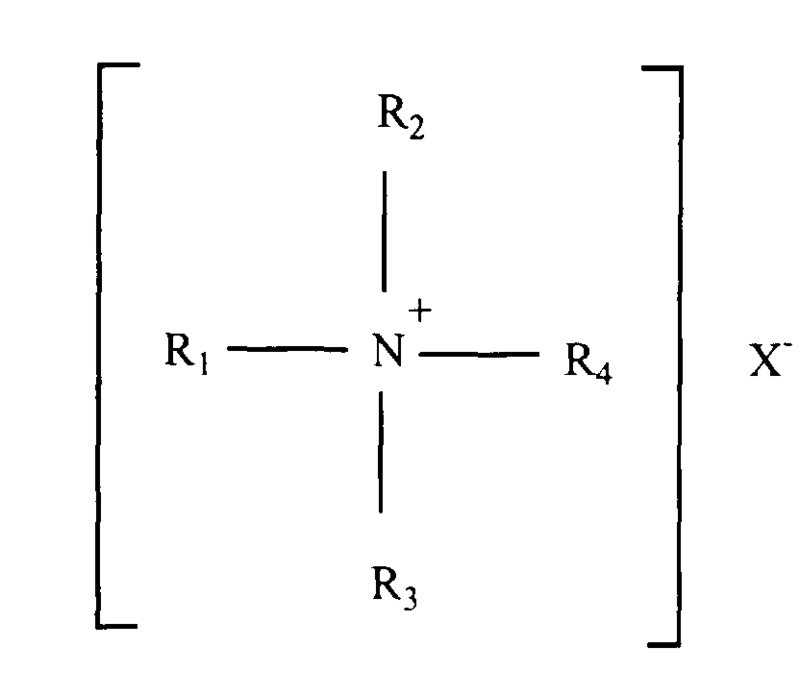 The hydrophobic group (R) can be attached at the 2-, 3-, or 4- positions rather than at the 1-position, (thus giving e.g. a glucosyl or galactosyl as opposed to a glucoside or galactoside). However, attachment through the 1- position, i.e., glucosides, galactoside, fructosides, etc., is preferred. In the preferred product the additional saccharide units are predominately attached to the previous saccharide unit's 2-position. Attachment through the 3-, 4-, and 6- positions can also occur. Optionally and less desirably there can be a polyalkoxide chain joining the hydrophobic moiety (R) and the polysaccharide chain. The preferred alkoxide moiety is ethoxide. Typical hydrophobic groups include alkyl groups, either saturated or unsaturated, branched or unbranched containing from 8 to 20, preferably from 10 to 18 carbon atoms. Preferably, the alkyl group is a straight chain saturated alkyl group. The alkyl group can contain up to 3 hydroxy groups and/or the polyalkoxide chain can contain up to about 30, preferably less than about 10, alkoxide moieties. The alkyl monosaccharides are relatively less soluble in water than the higher alkyl polysaccharides. When used in admixture with alkyl polysaccharides, the alkyl monosaccharides are solubilized to some extent. The use of alkyl monosaccharides in admixture with alkyl polysaccharides is a preferred mode of carrying out the invention. Suitable mixtures include coconut alkyl, di-, tri-, tetra-, and pentaglucosides and tallow alkyl tetra-, penta-, and hexaglucosides. The preferred alkyl polysaccharides are alkyl polyglucosides having the formula R2O(CnH2nO)r(Z)x wherein Z is derived from glucose, R is a hydrophobic group selected from the group consisting of alkyl, alkylphenyl, hydroxyalkylphenyl, and mixtures thereof in which said alkyl groups contain from 10 to 18, preferably from 12 to 14 carbon atoms; n is 2 or 3 preferably 2, r is from 0 to 10, preferable 0; and x is from 1.5 to 8, preferably from 1.5 to 4, most preferably from 1.6 to 2.7. 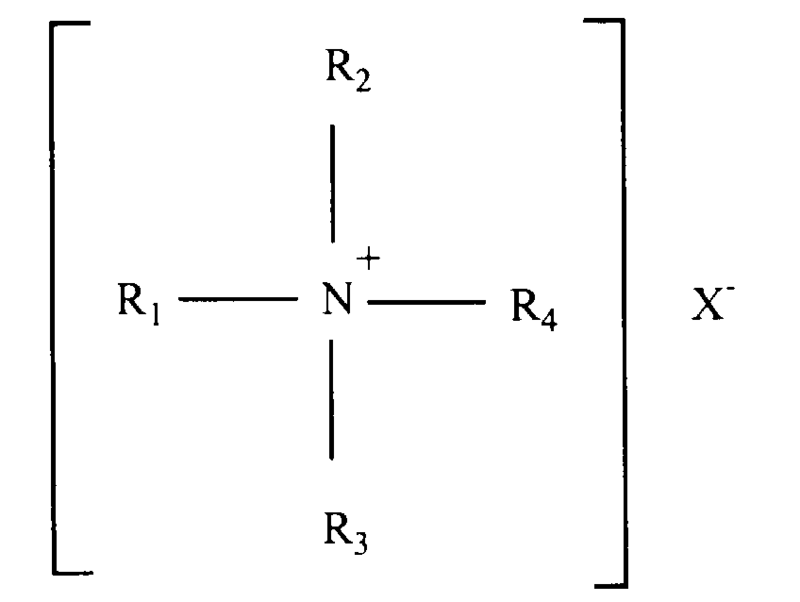 To prepare these compounds a long chain alcohol (R2OH) can be reacted with glucose, in the presence of an acid catalyst to form the desired glucoside. Alternatively the alkyl polyglucosides can be prepared by a two step procedure in which a short chain alcohol (R1 OH) can be reacted with glucose, in the presence of an acid catalyst to form the desired glucoside. Alternatively the alkyl polyglucosides can be prepared by a two step procedure in which a short chain alcohol (C1-6) is reacted with glucose or a polyglucoside (x=2 to 4) to yield a short chain alkyl glucoside (x=1 to 4) which can in tum be reacted with a longer chain alcohol (R2OH) to displace the short chain alcohol and obtain the desired alkyl polyglucoside. If this two step procedure is used, the short chain alkylglucosde content of the final alkyl polyglucoside material should be less than 50%, preferably less than 10%, more preferably less than about 5%, most preferably 0% of the alkyl polyglucoside. The amount of unreacted alcohol (the free fatty alcohol content) in the desired alkyl polysaccharide surfactant is preferably less than about 2%, more preferably less than about 0.5% by weight of the total of the alkyl polysaccharide. For some uses it is desirable to have the alkyl monosaccharide content less than about 10%. The used herein, "alkyl polysaccharide surfactant" is intended to represent both the preferred glucose and galactose derived surfactants and the less preferred alkyl polysaccharide surfactants. Throughout this specification, "alkyl polyglucoside" is used to include alkyl polyglycosides because the stereochemistry of the saccharide moiety is changed during the preparation reaction. An especially preferred APG glycoside surfactant is APG 625® glycoside manufactured by the Henkel Corporation of Ambler, PA. APG25® is a nonionic alkyl polyglycoside characterized by the formula: CnH2n+1O(C6H10O5)xH wherein n=10 (2%); n=122 (65%); n=14 (21-28%); n=16 (4-8%) and n=18 (0.5%) and x (degree of polymerization) = 1.6. APG 625 has: a pH of 6 to 10 (10% of APG 625 in distilled water); a specific gravity at 25°C of 1.1 g/ml; a density at 25°C of 9.1 lbs/gallon; a calculated HLB of 12.1 and a Brookfield viscosity at 35°C, 21 spindle, 5-10 RPM of 3,000 to 7.000 cps. The instant compositions can contain a silk derivatives as part of the composition and generally constitute 0.01 to 3.0 % by weight, preferably 0.1 to 3.0% by weight, most preferably 0.2 to 2.5% by weight of the liquid detergent composition. Included among the silk derivatives are silk fibers and hydrolyzate of silk fibers. The silk fibers may be used in the form of powder in preparing the liquid detergent or as a powder of a product obtained by washing and treating the silk fibers with an acid. Preferably, silk fibers are used as a product obtained by hydrolysis with an acid, alkali or enzyme, as disclosed in Yoshiaki Abe et al., U.S. Patent No. 4,839,168; Taichi Watanube et al., U.S. Patent No. 5,009,813; and Marvin E. Goldberg, U.S. Patent No. 5,069,898. Another silk derivative which may be employed in the composition of the present invention is protein obtained from degumming raw silk, as disclosed, for example, in Udo Hoppe et al., U.S. Patent No. 4,839,165. The principal protein obtained from the raw silk is sericin which has an empirical formula of C15H25O3N5 and a molecular weight of 323.5. Another example of a silk derivative for use in the liquid detergent composition of the present invention is a fine powder of silk fibroin in nonfibrous or particulate form, as disclosed in Kiyoshi Otoi et al., U.S. Patent No. 4,233,212. The fine powder is produced by dissolving a degummed silk material in at least one solvent selected from, for example, an aqueous cupriethylene diamine solution, an aqueous ammoniacal solution of cupric hydroxide, an aqueous alkaline solution of cupric hydroxide and glycerol, an aqueous lithium bromide solution, an aqueous solution of the chloride, nitrate or thiocyanate of calcium, magnesium or zinc and an aqueous sodium thiocyanate solution. The resulting fibroin solution is then dialyzed. The dialyzed aqueous silk fibroin solution, having a silk fibroin concentration of from 3 to 20% by weight, is subjected to at least one treatment for coagulating and precipitating the silk fibroin, such as, for example, by the addition of a coagulating salt, by aeration, by coagulation at the isoelectric point, by exposure to ultrasonic waves, by agitation at high shear rate and the like. The silk material which may be used to form the silk fibroin includes cocoons, raw silk, waste cocoons, raw silk waste, silk fabric waste and the like. The silk material is degummed or freed from sericin by a conventional procedure such as, for example, by washing in warm water containing a surfact-active agent or an enzyme, and then dried. The degummed material is dissolved in the solvent and preheated to a temperature of from 60 to 95°C, preferably 70 to 85°C. Further details of the process of obtaining the silk fibroin are discussed in U.S. Patent No. 4,233,212. A silk amino acid mixture resulting from the hydrolysis of silk of low molecular weight and having a specific gravity of at least 1 is produced by Croda, Inc. and sold under the trade name "CROSILK LIQUID®" which typically has a solids content in the range of 27 to 31% by weight. Further details of the silk amino acid mixture can be found in Wendy W. Kim et al., U.S. Patent No. 4,906,460. A typical amino acid composition of "CROSILK LIQUID®" is shown in the following Table . The instant composition can contain 0.1 to 4.0% of a protein selected from the group consisting of hydrolyzed animal collagen protein obtained by an enzymatic hydrolysis, lexeine protein, vegetal protein and hydrolyzed wheat protein and mixtures thereof. The present light duty liquid detergents such as dishwashing liquids are readily made by simple mixing methods from readily available components which, on storage, do not adversely affect the entire composition. However, it is preferred that the nonionic surfactant, if present, be mixed with the solubilizing ingredients, e.g., ethanol and, if present, prior to the addition of the water to prevent possible gelation. The surfactant system is prepared by sequentially adding with agitation the anionic surfactant, the betaine and the grease release agent to the non-ionic surfactant which has been previously mixed with a solubilizing agent such as ethyl alcohol and/or sodium xylene sulfonate to assist in solubilizing said surfactants, and then adding with agitation the formula amount of water to form an aqueous solution of the surfactant system. The use of mild heating (up to 100°C.) assists in the solubilization of the surfactants. The viscosities are adjustable by changing the total percentage of active ingredients. No polymeric or clay thickening agent is added. In all such cases the product made will be pourable from a relatively narrow mouth bottle (1.5 cm. diameter) or opening, and the viscosity of the detergent formulation will not be so low as to be like water. The viscosity of the detergent desirably will be at least 100 centipoises (cps) at room temperature, but may be up to about 1,000 centipoises as measured with a Brookfield® Viscometer using a number 3 spindle rotating at 12 rpm. Its viscosity may approximate those of commercially acceptable detergents now on the market. The detergent viscosity and the detergent itself remain stable on storage for lengthy periods of time, without color changes or settling out of any insoluble materials. The pH of this formation is substantially neutral to skin, e.g., 4.5 to 8 and preferably 5.5 to about 5.0. This invention also relates to all all purpose hard surface cleaner composition which comprises at least one surfactant, a grease release agent, a magnesium containing inorganic compound, perfume and water. The at least one surfactant is selected from the group consisting of nonionic surfactants and anionic surfactants, wherein said surfactants are selected from the name aforementioned surfactants used in forming the microemulsion compositions of the instant invention. The concentration of the anionic surfactant is 0 to 20 wt. %, more preferably 1 to 10 wt. % and the concentration of the nonionic surfactant is 0.1 to 10 wt. %, more preferably 0.5 to 6 wt. %. The grease release agent is the same as that used in the microemulsion composition and constitutes 0.1 to 15 wt. %, more preferably 1 to 10 wt. % of the all purpose hard surface cleaner composition. The magnesium inorganic compound is preferably magnesium sulfate heptahydrate and constitutes 0.1 to 5 wt. %, more preferably 0.4 to 3 wt. % of the instant composition. The perfumes which are selected from the same group of perfumes as in the microemulsion compositions constitute less than 0.3 wt. % of the composition, preferably 0.05 to 0.3 wt. %. The following examples are merely illustrative of the invention and are not to be construed as limiting thereof. 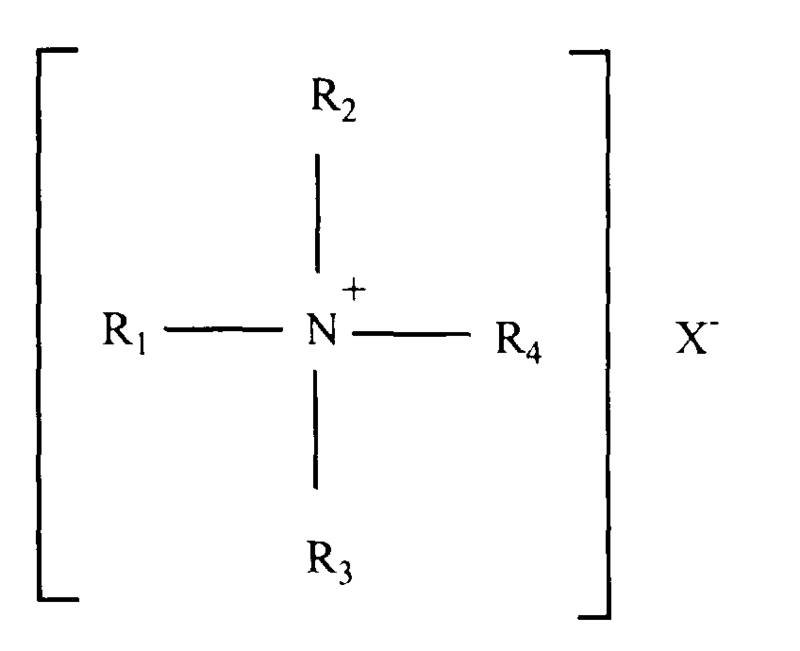 Furthermore, "dissolution power" of the o/w microemulsion of this example is compared to the "dissolution power" of an identical composition except that an equal amount (5 weight percent) of sodium cumene sulfonate hydrotrope is used in place of the diethylene glycol monobutyl ether cosurfactant in a test wherein equal concentrations of heptane are added to both compositions. The o/w microemulsion of this invention solubilizes 12 grams of the water immiscible substance as compared to 1.4 grams in the hydrotrope containing liquid composition. In a further comparative test using blue colored cooking oil--a fatty triglyceride soil --, the composition of Example 1 is clear after the addition of 0.2 grams of cooking oil whereas the cooking oil floats on the top of the composition containing the sulfonate hydrotrope. When the concentration of perfume is reduced to 0.4% in the composition of Example 1, a stable o/w microemulsion composition is obtained. Similarly, a stable o/w microemulsion is obtained when the concentration of perfume is increased to 2% by weight and the concentration of cosurfactant is increased to 6% by weight in Example 1. This concentrated formulation can be easily diluted, for example, three times with tap water, to yield a diluted o/w microemulsion composition. Thus, by using microemulsion technology it becomes possible to provide a product having high levels of active detergent ingredients and perfume, which has high consumer appeal in terms of clarity, odor and stability, and which is easily diluted at the usual usage concentration for similar all-purpose hard surface liquid cleaning compositions, while retaining its cosmetically attractive attributes. Naturally, these formulations can be used, where desired, without further dilution and can also be used at full or diluted strength to clean soiled fabrics by hand or in an automatic laundry washing machine. This example illustrates a diluted o/w microemulsion composition according to the invention having an acidic pH and which also provides improved cleaning performance on soap scum and lime scale removal as well as for cleaning greasy soil. The fat mixture is heated and sprayed with an automatic spraying device on cleaned and dried ceramic tiles. The cleaning procedure is done with the gardner device for both product concentrations. These results clearly demonstrate the important grease release effect obtained with formulas A, B, C, as well as acidic microemulsion, especially when the product is used diluted. The following light duty liquid detergent compositions were made according to the previously defined simple mixing procedure. The begining of the cleaning is must faster for the formula A than for the formula B. In summary, the described invention broadly relates to an improvement in microemulsion compositions containing an anionic surfactant, a nonionic surfactant, a cosurfactant, a hydrocarbon ingredient and water which comprise the use of a water-insoluble, odoriferous perfume as the essential hydrocarbon ingredient in a proportion sufficient to form either a dilute o/w microemulsion composition containing, by weight, 0.1% to 20% of an anionic detergent, 1% to 10% of a grease release agent; 0.1% to 50% of cosurfactant, 0.4% to 10% of perfume and the balance being water as well as to the previously described all purpose hard surface cleaner or light duty liquid detergent compositions having incorporated therein a grease release agent. 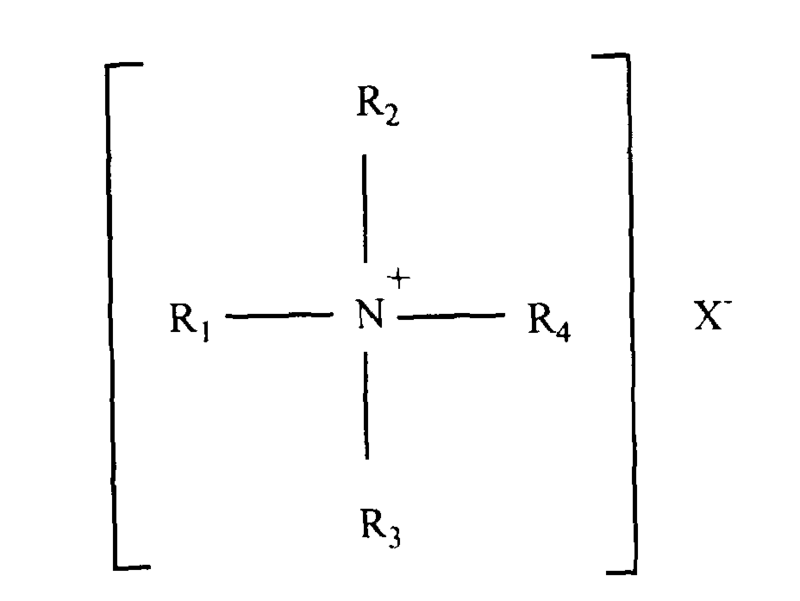 The cleaning composition of claim 2 which further contains a salt of a multivalent metal cation in an amount sufficient to provide from 0.5 to 1.5 equivalents of said cation per equivalent of said anionic detergent. 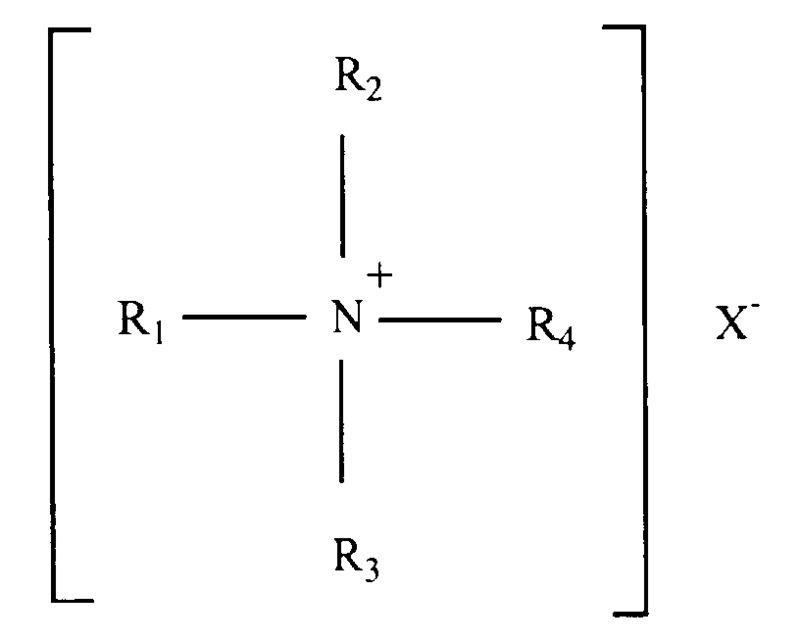 The cleaning composition of claim 3, wherein the multivalent metal cation is magnesium or aluminum. The cleaning composition of claim 2 wherein said composition contains 0.9 to 1.4 equivalents of said cation per equivalent of anionic detergent. The cleaning composition of claim 4 wherein said multivalent salt is magnesium oxide or magnesium sulfate. The cleaning composition of claim 2 which contains from 0.5 to 15% by weight of said cosurfactant and from 0.4% to 3.0% by weight of said hydrocarbon. The cleaning composition of claim 2 wherein the cosurfactant is a water soluble glycol ether. The cleaning composition of claim 8 wherein the glycol ether is selected from the group consisting of ethylene glycol monobutylether, diethylene glycol monobutyl ether, triethylene glycol monobutylether, poly-propylene glycol having an average molecular weight of from about 200 to 1,000 and propylene glycol tert.butyl ether, mono, di, tri propylene glycol monobutyl ether. The cleaning composition of claim 9 wherein the glycol ether is ethylene glycol monobutyl ether or diethylene glycol monobutyl ether. The cleaning composition of claim 2 wherein the cosurfactant is a C3-C6 aliphatic carboxylic acid selected from the group consisting of acrylic acid, propionic acid, glutaric acid, mixtures of glutaric acid and succinic acid and adipic acid and mixtures of any of the foregoing. The cleaning composition of claim 11 wherein the aliphatic carboxylic acid is a mixture of adipic acid, glutaric acid and succinic acid. The cleaning composition of claim 2 wherein the anionic surfactant is a C9-C15 alkyl benzene sulfonate or a C10-C20 alkane sulfonate. A light duty liquid detergent according to claim 16 wherein at least one said surfactant is selected from the group consisting of fatty acid soap surfactants,non-ionic surfactants, anionic surfactants, zwitterionic surfactants and alkyl polysaccharide surfactants and mixtures thereof. A liquid detergent composition according to claim 17 which includes 1 to 15% by weight of a solubilizing agent selected from the group consisting of C2-C3 mono- and dihydroxy alkanols, water soluble salts of C1-C3 substituted benzene sulfonate hydrotropes and mixtures thereof. A liquid detergent composition according to claim 18 wherein ethanol is present in an amount of 5% by weight or less. A liquid detergent composition according to claim 17 wherein said nonionic surfactant is a condensate of a primary C8-C18 alkanol with 5-30 moles of ethylene oxide. A liquid detergent composition according to claim 20 wherein said anionic detergent is selected from the group consisting of C12-C16 alkyl sulfates, C10-C15 alkylbenzene sulfonates, C13-C17 paraffin sulfonates and C12-C18 alpha olefin sulfonates. A liquid detergent composition according to claim 17 wherein said nonionic surfactant is present in an amount of 1% to 25% by weight, said anionic detergent is present in an amount of 1% to 30% by weight and said zwitterionic surfactant is present in an amount of 1% to 9% by weight. A liquid detergent composition according to claim 17 wherein said anionic detergent is a C12-C16 alkyl sulfate. A liquid detergent composition according to claim 17 further including a preservative. A liquid detergent composition according to claim 17 including a color stabilizer. An all purpose hard surface cleaning composition according to claim 26, wherein at least one said surfactant is selected from the group consisting of anionic surfactants and nonionic surfactants and mixtures thereof. An all purpose hard surface cleaning composition according to claim 27, wherein said cosurfactant is a monoalkyl ether or ester of ethylene glycol or propylene glycol. An all purpose hard surface cleaning composition according to claim 28, wherein said magnesium containing inorganic compound is magnesium sulfate heptahydrate.